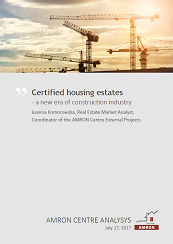 AMRON Centre is a professional analytical and research center, specializing in issues concerned with changes in real estate transaction prices and impact of those changes on the perspectives of Polish housing market. 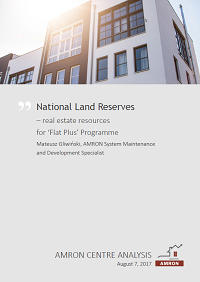 Except for professional reports prepared accordingly to the detailed specifics delivered by investors, developers and other entities seeking for solid information on particular market segment, location and time period, we also prepare analytical publications referring to the current situation on Polish housing market and actual problems concerned with that market. What makes our publications an unique source of knowledge, is the basis of our analyses – our database. Unlike publications of other housing market consulting companies, our reports express the actual picture of the market, based on transaction prices. You are welcome to check out the below publications – they are free of charge. Before downloading, please leave us your e-mail address and we’ll let you know about next articles. 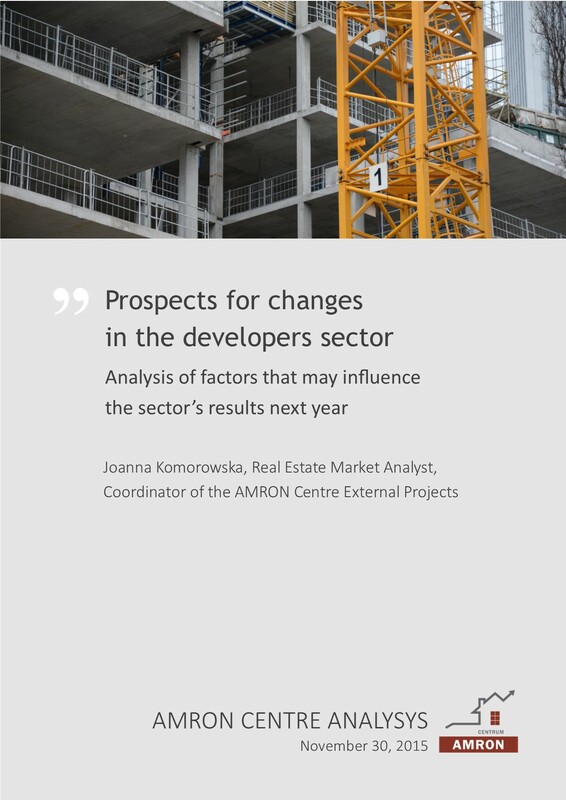 Are you interested in individually tailored report, please contact us via e-mail on raport@amron.pl. 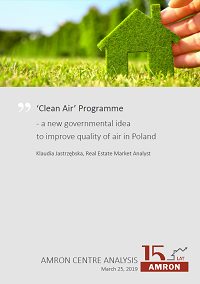 In September last year, a new priority ‘Clean Air’ Programme was launched. The aim of the Programme is to reduce pollutant emissions from obsolete household furnaces combusting low-quality fuel. The Programme is executed by National Fund for Environmental Protection and Water Management in cooperation with Provincial Funds for Environmental Protection and Water Management and is planned to operate in 2018 – 2029 (agreements may be concluded until December 31, 2027). The programme’s budget amounts to PLN 103 billion. For last 15 years we have witnessed a process of growth and slow maturation on each segment of Polish real estate market. The beginning of that periodwas the time when the development market was just beginning to crawl, the level of financing on the real estate market was, in comparison to the present times, insignificant and the prices of real estate of all types were much lower than they are today. According to Central Statistical Office’s statistics published on the basis of the last National Population and Housing Census 2011, approx. 19.5 million of Poles - almost 90% of rural population and nearly 30% of inhabitants of towns and cities - live in single family houses. The average usable area of a single family house varies according to location and in cities amounts from 102.7 m2 to 131.4 m2, while in rural areas it ranges from 113.4 m2 to 89.9 m2 . Such housing condition is usual for Poles, who live in houses. How is it in case of much more prosperous persons? Below you’ll find few the most expensive properties in the world, ranked by American website time.com. 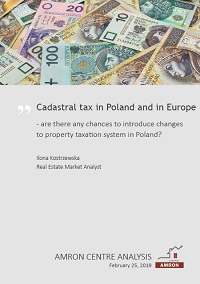 The idea of cadastral tax implementation in Poland for many years has aroused big controversy. At the moment, a real estate tax applicable in Poland is calculated on the basis of the property’s area. 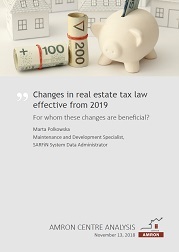 The concept of changing the rules by introducing taxation based on the property’s value was proposed many years ago, but the first legislation related to this issue was the Property Management Act introduced on August 21, 1997. Since then, none of Polish governments decided to introduce any changes in that scope, mostly due to significant aversion of the Polish public toward new fiscal burdens. Polish market of houses is growing. In first three quarters of the last year 87 188 building construction permits were issued, 77 244 of which were single-family houses. For decades, mainly brick and stone technologies have been known and applied in the construction of single-family buildings in Poland. 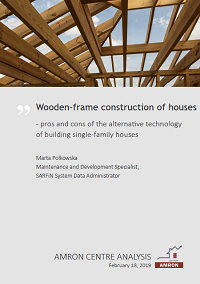 In Scandinavia or Canada the climate is more severe but wooden-framed houses have taken forefront for many years, while use of wooden construction methods by individual investors in building residential premises in Poland amounted to 0.3% both in 2015 and in 2016. Although this technology is becoming a convenient alternative to traditional brick houses, over the years it has grown into many myths and arouses contradictory opinions. 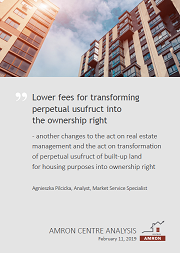 On January 1, 2019, perpetual usufructuaries of land used for housing purposes became its owners. This is certainly a positive change that orders legal situation of plots, especially in the largest cities, however, due to the labour-intensive obligation of issuing certificates confirming the transformation and the amount of transformation fee, it also caused chaos on the real estate market. In response to numerous complaints from citizens, the government is working on further changes to the principles of transforming the perpetual usufruct into the ownership right. On February 1, 2019 the Senate adopted an amendment to the act on real estate management and the act on transformation of perpetual usufruct of built-up land for housing purposes into ownership right. Smart city is a city that succeed to develop in the most important fields, basing on ‘intelligent’ combining technology and operations. The most complementary and exhaustive explanation highlights the role of synergy, combination of technology and actions that impact on increase in quality of the key aspects of the city life: spatial management, transportation, ecology, natural resources and the citizens’ awareness. What are the pillars of a smart city? Does any of the Polish cities deserve to be called Intelligent City? In November last year, the Government Legislation Centre received the fourth version of the draft Act on agriculture system shaping and on amendments to certain other acts. 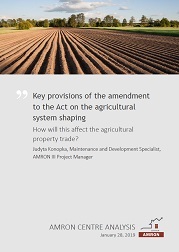 The aim of amendments is to relax the regulations that limited the agricultural land trade, which have been in force since April 30, 2016 and were introduced by the Act on suspension of the Treasury agricultural land sale and on amendments to certain other acts. What are the changes? What are the market expectations? Who will the changes be beneficial for? In 2018, as in previous years, the situation on both residential real estate and mortgage markets was shaped primarily by good economic situation, resulting in wages increase and - in consequence - increase in purchasing power of income, as well as NBP interest rates, maintaining low costs of mortgage loan service and encouraging to search for alternative methods of investing savings. How were the average housing prices in individual Polish cities shaped? What legal regulations were introduced in 2018? Government programme ‘Family on Its Own’ was introduced in 2007 and it contributed to covering the housing needs of over 192 thousand of households. According to the Programme’s assumptions, beneficiaries, who met the criteria set in the relevant act and who were granted a preferential mortgage loan, were supported by state subsidy accounting for 50% of the interest component of loan instalment. The subsidy was paid for the first eight years of the mortgage loan repayment. Starting from 2015, after the eight years of ‘interest vacations’, the following loans have started the regular repayment schedule, which meant increased instalment amounts. International Monetary Fund predicts that the global economic growth in 2019 will be slightly lower than previously forecasted 3.8 percent and will amount to 3.7 percent. Trade war between the US and China, slightly weaker results of European and other key global economies, as well as increases of interest rates in developed countries are indicated as main reasons of such prognosis. Brexit, which is due to happen in March 2019, will also have important impact on European economies. How will Polish housing market perform in the months to come? On housing market in Poland, a significant recovery has been noted for several years. In the period from 2014 to 2017, all indicators describing the results of this sector increased. Comparing the results of 2014 and 2017 published by the Central Statistical Office, the number of dwellings completed increased by 25%, the number of constructions started increased by 39%, while the increase in number of construction permits issued amounted to 60%. At the end of 2018 (based on the results of the first 10 months), the increases may amount to 30%, 50% and even 60% respectively in comparison to 2014. However, the regional housing markets have been developing at different rates. In the newest proposition of amendment to Recommendation S, Financial Supervision Authority introduced new mortgage loan model with an option called ‘key for debt’, which enables the borrower to repay the loan by transferring the property ownership right to the bank. The idea of transferring the property right in return for debt release was probably taken from American market, where such solution has been practised for a long time. What are the chances to implement such solution in Poland? Government draft bill amending the Act on Personal Income Tax, the Act on Corporate Income Tax and some other acts was approved by the Council of Ministers and submitted to the Sejm. Proposed changes, which will come into force on January 1, 2019, can be regarded as beneficial for taxpayers, in particular for inheritors, divorcees and persons allocating the income obtained from the inherited property’s sale for purchase of another real estate on the primary market. Form one hand, for many years it has stood for the most dangerous district both for inhabitants and tourists. From the other hand, particularly in last few years, due to its exceptional character, it became an oasis for artists and manufacturers, a basin of trendy clubs, a place attracting both foreign tourists and people who look for original place to live and therefore – a location of increased interests of developers and investors. What are the reasons for changes in the perception of the district by residents and investors? Perpetual usufructuaries of lands used for housing purposes will become owners of such plots, effective on January 1, 2019. Perpetual usufruct will be transformed into ownership right under payment. Future owners will be obliged to pay annual ‘transformation fee’ for the period of 20 years. Under which conditions transformation may take place? What are the expected results from perpetual usufructuaries’ point of view? Increasing shortage of investment plots imposes developers to take prompt decisions on purchases such plots. Due to the spatial nature of the issue, GIS tools seem to be the best solution for analysing the investment potential of the plot. Spatial analysis may be helpful not only for assessing particular properties, but also for choosing new investments locations. 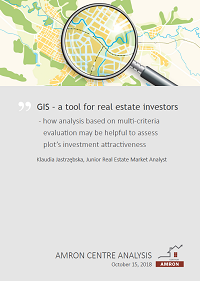 Due to standardisation and quantification of determinants of the investment potential of plots of land, analysis based on multi-criteria evaluation enables the objective and comparable assessment of the location and neighbourhood of the specific plot. A special housing law enables the implementation of housing investments and investments that are not in accordance with local spatial development plans. Local plans result from the communal spatial policy’s implementation, which imposes restrictions and standards for land development in order to protect the public interest and ensure a healthy, sustainable living environment. Introducing a parallel path to the development permit adds additional chaos in the spatial policy of the commune. Despite significant progress observed within recent, Podlaskie, Lubelskie and Podkarpackie voivodships remain one of the least developed and least prosperous regions of both Poland and the entire European Union. The level of wages is similar in all provinces of the region, however, the demographic situation in the capitals of analysed voivodships is highly diversified. 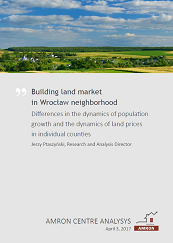 Most analyses consider the whole Eastern Poland region as relatively homogeneous, however, the sound examination of the situation on residential markets in Białystok, Lublin and Rzeszów proves major differences between them. Rental market in Poland is still small, but it has developed significantly in the last few years. According to Eurostat data as for 2017, 4.3% of Poles (1.6 million out of the whole population) lived in apartments rented on market terms, while in Germany tenants accounted for 38% of the population. However, comparison of the latest Poland's result with statistics for the year 2009, when tenants accounted for only 2.2% of the population, showed rapid progress in that field. According to developers, currently every third apartment on primary market is bought for investment purposes, and approximately 30 - 40% of premises are purchased without the participation of a housing loan. Prosperity on housing market is driven among others by an increasing number of foreigners, who decide to buy a dwelling in Poland. According to data published by Central Statistical Office (GUS), the number of housing units completed by developers in 2017 amounted to 90.4 thousand. As stated in the MSWiA Report on execution of the act on real estate acquisition by foreigners, in 2017 foreigners purchased over 4.8 thousand dwellings with a total area of almost 305,000 sq.m. Despite the slight slowdown in the upward trend in sale of dwellings to foreigners, the interest of foreign buyers in Polish apartments is still significant. By signing the developer agreement, which is the completion of dream dwelling selection process, both developer and purchaser provide themselves a legal guarantee to execute a specific property acquisition transactions at a fixed price within a time limits. 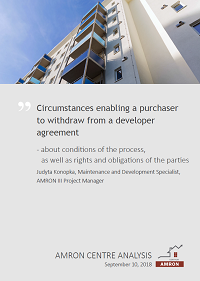 In particular cases the purchaser has legal basis to withdraw, in others - the best solution is to contact the developer and discuss the situation, but in such situation the purchaser must expect some financial consequences. It’s good to have on mind old Latin philosophy pacta sunt servanda, which means that agreements must be kept, so all decisions on signing the contracts should be taken prudently and foresightedly. The second quarter of 2018 is the following, already 14th period of the uninterrupted prices increase on housing markets of the largest Polish cities. In comparison with other major Polish cities, the recorded increases in prices were not the highest here - the result was slightly lower than recorded in Krakow and much lower than in Gdansk. Lower than Warsaw’s price increase dynamics was recorded in Wrocław and in Poznan. Warsaw's most expensive district is obviously Śródmieście, where in the second quarter of 2018 the average price per sq.m. of a flat amounted to PLN 12 557. Almost twice lower average price was noted in Rembertów - the average price per sq.m. of a flat amounted there to PLN 6 294. On August 7, a contract for development of a comprehensive project documentation for a housing investment in Warsaw was concluded. A multi-family housing complex comprising of approx. 2.7 thousand apartments for rent located on a plot of 15 hectares in Warsaw district Ursynów is planned to be constructed as part of the ‘Flat Plus’ Programme. The contract was concluded between BGK Nieruchomości S.A. and the winners of the March urban contest for a model housing project: ‘AMC design studios - Andrzej M. Chołdzyński’ and ‘22Architects’. Both studios were awarded ex aequo as winners of the competition for the urban project of the family-friendly residential area Nowe Jeziorki. With increasing environmental awareness, natural resources in housing construction became more and more popular. 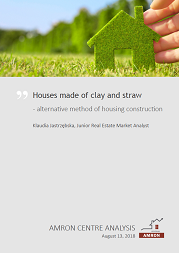 Houses made of clay and straw are becoming increasingly popular in Poland – such buildings do not remind of mud huts, they are actually modern and energy efficient. 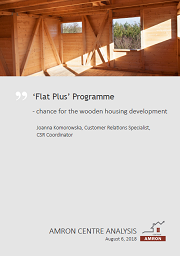 Under the 'Flat Plus' Programme, a wooden housing is planned to be developed. The Sejm has already passed a bill amending the Forest Act and the Environmental Protection Act, establishing a new entity – ‘Polish Wooden Houses’ company (‘Polskie Domy Drewniane’ - PDD). The idea of implementing wooden construction arose not only by government’s will to increase availability of housing for the public, but also by ecological reasons (natural and renewable material, it is 100% recyclable or biodegradable). From the other hand, doubts concern the quantity and value of forest resources that will be consumed by the investment, as well as precise origins of wood used in the production. by tourists not only during the holiday season may amount even 8-9%. Construction is one of the key sectors of the Polish economy. Despite increase in construction output and positive economic situation ratio, it does not reflect in more favourable financial situation of this industry’s companies. labour market situation, new legal regulations, demand fluctuations or investment financing conditions. 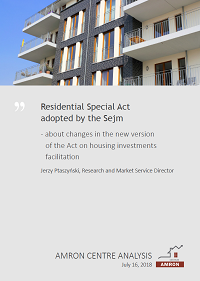 On July 5, the Sejm adopted a law on housing investments facilitation , so-called the ‘Residential Special Act’. of the decision on the housing investment location with the study, determine provisions regarding the organization of urban and architectural competitions and introduce changes regarding access standards for technical and social infrastructure. The Residential Special Act also includes provisions aimed at unblocking land for housing by automatic transformation of the agricultural land located within the city bounders into building land. Termination of a loan agreement by a bank that financed or refinanced the property purchase, providing the borrower with payment request for the whole outstanding debt and applying to the court to issue an enforceable title with the enforcement order are actions prior to formal beginning of the forced execution. Next stages are entry of the record on enforcement initiation into the section III of land and mortgage register, contact with the customer, the first and the second auction, and finally the distribution of funds obtained from the sale. Apart from the enforcement proceedings, the eviction is in progress. Mediation efforts between the current owner and the previous one seem to be a positive trend. Torun is one of the oldest towns in Poland, the sixteenth greatest Polish town in terms of population, as well as an important economic, touristic, cultural and academic centre. What’s worth mentioning, Torun is also one of the “greenest” Polish towns with green areas (parks etc.) extending to approx. 30% of its total area. 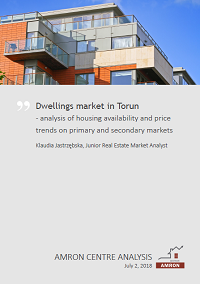 Housing market in Torun is constantly developing, many new investments have recently been stated. In 2017 the record-breaking number of issued construction permits was recorded – it was approx. 135% higher comparing to the previous year, while the number of completed housing units increased by 31%. On June 21, an Act on Central Communication Port (CPK) signed by the President entered into force. The act is aimed to simplify the implementation of a number of projects within the giant project of an integrated communication hub. It sets out rules and conditions for preparation, financing and implementation of construction investments and accompanying infrastructure around the Central Communication Port. It also specifies rules of land reservation, issue of a location decision and acquisition of real estate, as well as entities competent in the above mentioned matters. Furthermore, it defines the government's proxy for the CPK and the corporate governance carrying out investments. 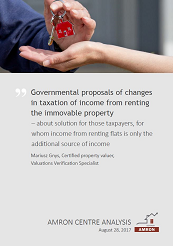 tax preferences apply only for companies that rent residential properties. 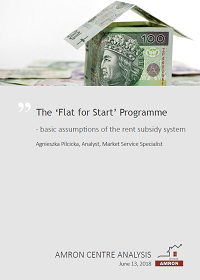 The ‘Flat for Start’ Programme is a system of rent subsidies for the first tenants of new dwellings and revitalized apartments as part of cooperation between investors and municipalities. 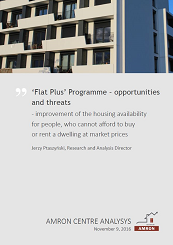 Apart from construction of new housing buildings, it constitutes a strategic element of the ‘Flat Plus’ package. The government subsidies will be available to people who cannot afford to buy their own apartment, apply for a housing loan or rent a flat on the market, while the amount of their earnings exclude them from the group of a communal or social flat beneficiaries. According to analysis of the Ministry of Infrastructure and Construction, 40% of Poles are in this situation. to wealthier seniors. But the fact is that dominant amount of retirement pension in male population is PLN 2 177.80 and in female population - PLN 1 065.38.
to meet their own housing needs. 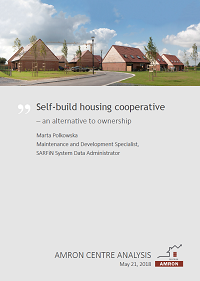 Members of the self-build housing cooperatives decide to cooperate in order to buy land for co-ownership and build a residential housing estate on it, where everyone will have their own housing. Residents decide about financing and the course of the entire investment. Costs of housing construction in this type of initiative may be even 20-30% lower than when purchasing similar flats on the primary market. was submitted for public consultation. The most radical change introduced by the act is the exclusion of housing investments from the Act of March 27, 2003 on spatial planning and development. housing on a particular plot. Piaseczno is a town in Mazovian voivodship, located only 17 km south from the centre of Warsaw, extending for 16.22 sq.km. According to Central Statistical Office, at the end of 2016 the population of Piaseczno accounted for 47 092 persons and it has been continuously growing – from 2002 it increased by 13 362 persons. 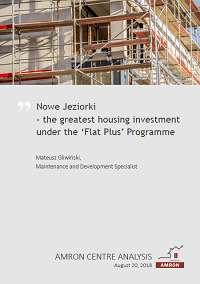 Systematic increase in number of new housing investments in the whole Piaseczno poviat was recorded from 2013. In 2017 number of construction permits for housing units increased by 56% comparing to the previous year and it amounted to 3 351. Due to growing Piaseczno population, number of completed units has increased as well. 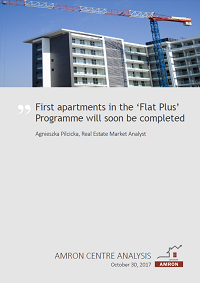 More and more new investments are being undertaken every year on the housing market in Rzeszow. The most popular apartments with an area ranging from 50 to 75 sq. m. accounted for over 50% of the total number of flats sold in 2017. The second place in terms of popularity was taken by flats with an area between 35 and 50 sq. m.
from 2012 to the present, the average price of apartments from secondary market oftentimes exceeded the average price of apartments bought on the primary market. 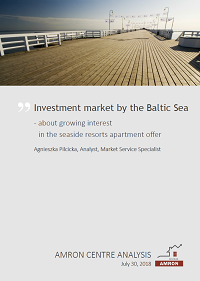 More and more new housing investments in Szczecin are started each year. The year 2017 was the record-breaking from the perspective of new construction permits – there were 4 120 new permits issued in 2017, which was 57% more than in 2016. Despite the Szczecin population has been decreasing since the early 1990s, number of housing units completed in 2017, after significant increase in 2016, remained at a similar level. In 2010 - 2017 most of flats were purchased on secondary market – in 2017, trading volumes noted on the secondary market were over four times higher than on the primary market. 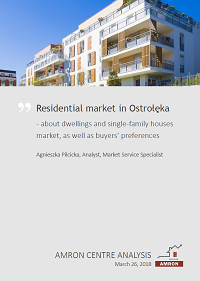 Developers are doing quite well on Ostrołęka real estate market. Over the last few years, several hundred new dwellings have been built. More and more new dwellings are built, and their prices range from about 3 500 to even PLN 4 800 /sq.m. High prices of dwellings on primary market and their worse location prompt buyers to choose dwellings from secondary market, where prices can be lower by even PLN 1 000. Due to the relatively high transaction prices of dwellings and cheap building plots for single-family houses, individual construction is very popular on residential market in Ostrołęka. The problem with ensuring the right to parking spaces has appeared simultaneously with the appearance of buildings with underground multi-space car parks in Poland and it is caused by the fact that determining the parking place’s borders is confined to marking lines on the ground. This means that parking place cannot be a distinct unit, because it does not meet the definition set out in Article 2 (2) of the apartment ownership act. Pursuant to this act, the distinct dwelling is a room or a set of rooms within a building, separated by permanent walls. Parking space cannot be considered as a belonging premises, because it does not constitute a room. 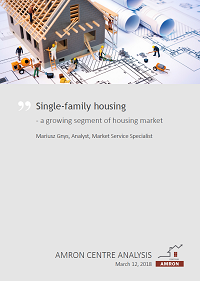 Good market situation in construction industry did not avoid segment of single-family houses – their supply is the largest since last five years. This phenomenon is mainly caused by improving financial situation of Poles, growing employment, rising wages and state support in the form of e.g. ‘500 Plus’ Programme. Despite the fact that since mid-2015 the amendment to the Construction Law has been binding, introducing possibility to build single-family houses on the basis of notification, most of houses are being built on the basis of decisions on construction permit issued. In 2017 only 3,303 single-family houses were built on the basis of notification. will have no legal tools for eviction. Occasional rental agreement protects landlord’s rights much better, but it requires tenant’s statement prepared in the form of the notarial act, declaring tenant’s will to submit to execution and indicating flat to move in after expiration of the contract. Institutional rental agreement does not require to indicate a flat in case of termination of agreement. For each type of contract, it is important to think about its content and additional documents. of a housing unit or a single-family house purchasers has not solved many problems important from the consumer’s point of view. Therefore, changes proposed by the Office are to ensure security for purchasers, e.g. if developer ceases to work on the construction site, goes bankrupt or bank terminates the contract for an escrow account. If they are approved, the housing purchasers will get higher protection of their rights, as well as gain a greater sense of security over the financing process and better control over invested capital. the transformation, trade and services have become the leading branches of the economy. As a result, agriculture land has massively been changed into development land. 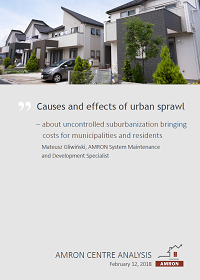 Nowadays areas designated for development characterize with strong fragmentation of plots. Abandoning the process of merging and dividing land and the lack of control over spatial growth caused the spontaneous creating of formation of buildings ‘anywhere’. MICRO HOMES – NEW TREND IN HOUSING CONSTRUCTION? 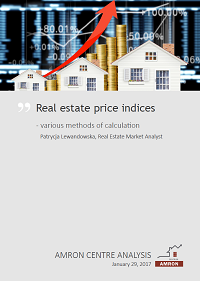 Housing price indices are the basis for analysing and forecasting the dynamics of changes in properties value. They measure the change in the price of a single good or basket of goods in a specific period in relation to the price of the same good or basket of goods in another period. Properties are not homogeneous - they differ in terms of area, standard, location and other characteristics. Additionally, typical feature of real estate market is the irregularity of transactions that occur on it. All this makes construction of a reliable price index not an easy matter. Siedlce is fourth most populous province of Mazovia with a population of 77 020 citizens in 2016. Number of inhabitants has been slightly increasing, which might translate into increased housing demand. 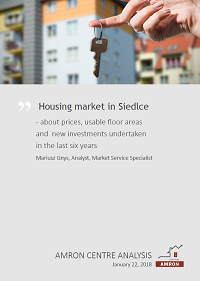 On average, housing prices on primary market in Siedlce are higher than on secondary market by PLN 400. As for the end of 2017, housing prices in Siedlce were the highest since the beginning of 2012.
concerned housing units with usable floor area ranging from 50 to 75 sq.m. In 2017 Polish housing market continued a winning streak, which has been lasting already four years. It was another record-breaking year in terms of both building and sales of dwellings. An increase in the average transaction price per 1 square meter of floor area during the last year was recorded in all analysed agglomerations. Also analysis of housing rent agreements in most of the largest urban centres in Poland showed an upward trend. In comparison to the results recorded in the period from January to November 2013, last year there were 61% more dwellings built by developers, the number of started constructions was twice as high and the number of permits issued increased by 136%. Year 2017 brought revival on the mortgage market in Poland. Data from the SARFiN System indicate that we have witnessed the best year since 2011. During the first three quarters of 2017 a 6.89% growth in terms of quantity was observed, compared to the results recorded in the corresponding period of the previous year. In terms of value, the growth was even higher and reached 13.23%. The growth in demand for mortgage loans recorded in 2017 was influenced most of all by low interest rates level, as well as by increased housing availability. At the same time, expanding loan margins have chilled the situation on the mortgage market in the first half of the year. Lodz is the third largest city in Poland in terms of population size according to Central Statistical Office (GUS) -in 2016 it was inhabited by 696 503 residents. Many universities are located in the city, as well as headquarters and branches of international and domestic companies. The balance of migration for permanent residence recorded by Central Statistical Office since 2005 is invariably negative, however, many new investments are being made in the capital of Lodzkie Voivodship. 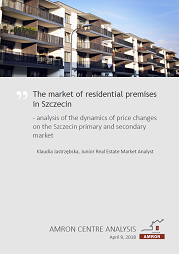 The dynamics of residential housing prices on both primary and secondary market in Lodz are similar. Most real estate market analysts admit recently that significant part of the demand for flats comes from private investors buying apartments for rent. Historically low level of interest rates, effectively discouraging people from keeping money on bank deposits, seems to be the main reason for this. Uncertain prospects of the pension system resulting from the unfavourable demographic situation, additionally deepened by lowering the retirement age, is also an important factor. Along with winning streak of developers, record sales and fast pace of starting new projects, housing sector has been changing in qualitative terms at every stage of the construction process: planning, investing and project commissioning with after-sales service. Perpetual usufruct, which was introduced into the Polish legal system in 1961, is specified by a numerous experts as a relic of previous era, as modelled on soviet solutions. 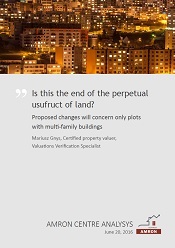 Unclear situation of a building and housing units constructed on a plot used on a basis of a perpetual usufruct agreement after the end of the usufruct has been an issue of serious concerns. The court jurisdiction in this regard was inconsistent. The supreme court has adopted a position and stated the expiration of perpetual usufruct does not cause expiration of ownership of premises located in the building situated on the used ground (resolution of the Supreme Court dated August 25, 2017, Ref. No. III CZP 11/17). 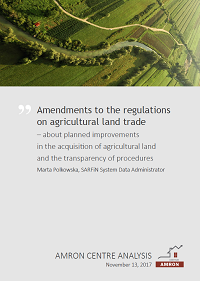 The Land Act on suspension of the Treasury agricultural land sale and on amendments to certain other acts, which changed, among others, act on Agriculture System Forming, was planned to reduce the sale of Polish land to foreigners, but the number of transactions concluded actually increased compared to previous years. Strict rules of purchase and sale of agricultural land introduced in the Land Act have limited the trade in agricultural land mainly among Polish farmers. After nearly a period of 18 months when the new law has been in force, the Ministry of Agriculture and Rural Development has prepared proposals for changes aiming to clarify the binding legislation. Several government programmes aiming to support Polish families, i.e. ‘500+’ or ‘Flat Plus’, along with positive economic trends, increasing salaries and diminishing unemployment, contributed to systematic improvement of the households’ financial standing. However, according to the newest data published by Central Statistical Office, many families still have significant housing problems – only in 2016, over 7 200 eviction proceedings were conducted, while in 2015 there were 8 200 of such proceedings executed. The ‘Flat Plus’ Programme is gaining momentum. More than 70 cities have expressed their intention to join the Programme, and the pool of plots for the construction of dwellings meeting the criteria of the Programme is constantly growing. According to information provided by the Ministry of Development, currently more than 10 thousand apartments in approx. 20 Polish cities are being prepared within the commercial part of the Programme, more than 1.2 thousand of which are under construction. 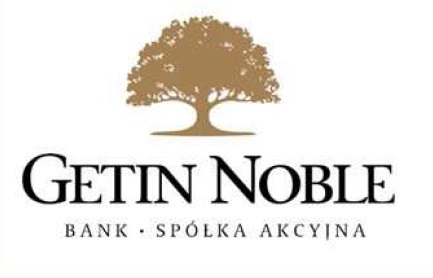 Total value of investments by BGK Nieruchomości S.A. amounts to over PLN 2 bn. According to data collected in SARFiN System, in the last four quarters there were 184 621 mortgage loans granted in Poland for the total amount of PLN 42.152 billion. After a good first quarter, when mortgage lending was supported by government subsidies under the ‘Flat for Youth’ Programme, the second quarter of this year repeated the result of the first one. This allows to forecast the optimistic yearly outcomes at the level of approx. 200 000 new mortgage loans amounting to PLN 50 billion. Spatial analysis of Polish mortgage market could be an interesting supplement to the data provided in quarterly AMRON-SARFiN Reports. On October 6, the public consultations on a new law simplifying the investment process were closed. New law aims to eliminate "bottlenecks" of the investment and construction process. 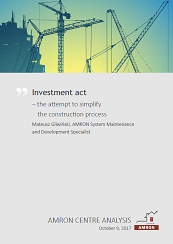 Act on amending certain acts in relation to simplification of the investment and construction process (which is the full name of the new regulation) introduces numerous changes to the Building Law, Geodesy and Cartography Law, or the Planning Act, which are the initial introduction of planning system modification included in Urban Building Code (KUB). Government wants to encourage private and public entities to start new projects and therefore to increase the number of investment. Gdansk, the capital of the Pomeranian Voivodship located over the Gdansk Bay, is the sixth largest city in Poland in terms of population size according to the Central Statistical Office (GUS) - in 2016 it was inhabited by 463 754 persons. The city is an important university centre in the country, moreover, the migration balance has been positive for the last few years, which certainly creates suitable conditions for the development of the housing market. 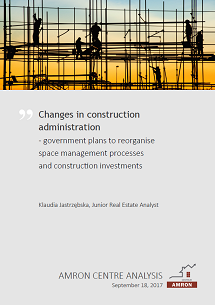 Under the ongoing space management reform, concurrently to presently proceeded Urban Development and Construction Code, two new draft acts were presented: act on investment construction administration and general building authority and act on architects, construction engineers and urban planners.Purpose of the new regulations is to reorganise space management processes and construction investmens. The Act on National Land Resources enters into force on September 11, 2017. 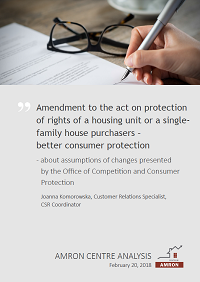 In addition to regulations related to the ‘Flat Plus’ Programme implementation, the Act introduces significant changes to tenancy rules of housing properties. 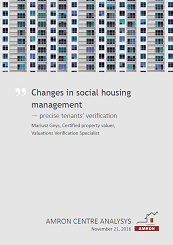 The most important change limits the group of landlords renting flats based on the occasional lease agreement only to those not running business activity in the area of housing rent and introduces a new, third type of housing rent, so-called institutional rent. Those taxpayers, who obtain significant incomes from private rent of dwellings, may feel anxious about changes announced recently by Ministry of Finance. Draft act of July 6, 2017 on changes in several tax acts sets an income limit from renting the immovable property entitling to a flat tax rate. The amendment assumes an yearly limit of the personal income at the level of PLN 100 000 for taxpayers, who do not pursue business activity. On July 27, during the emotional debates on the Supreme Court, the Senate adopted the act on National Land Resources. The new law establishes a new state legal unit - National Land Reserves (KZN), designed to manage the property of the State Treasury, to create favourable conditions for social housing development and financing, as well as to conduct all necessary preparations of plots of land for investments in terms of technical requirements. Moreover, KZN will be a research centre providing analytical work in the fields of housing, real estate, construction, spatial planning, revitalization and popularizing innovative solutions in cooperation with research institutions and universities. 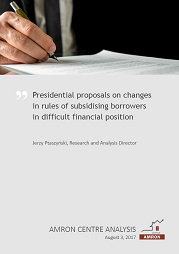 On August 2, 2017 president Andrzej Duda submitted to the marshal of the parliament a draft bill to change the mechanism for subsidizing the mortgage borrowers in difficult financial position, as well as to launch a new instrument supporting voluntary restructurings of currency mortgage loans. New act determines conditions for granting the repayable assistance to natural persons - parties to the loan agreements obliged to repay mortgage loans, who found themselves in situations of financial difficulties, rules of granting credits for repayment of part of the loan remaining after the property sale and sets principles for voluntary currency restructuring. Plock situated by the Wisla river is the third city in Masovian Voivodeship in terms of population size (following only Warsaw and Radom) – according to data gathered by Central Statistical Office of Poland number of Plock habitants in 2016 equalled to 121,295. (...) In years 2012 – 2017 average prices of dwellings per one square meter in Plock were quite stable both on the primary and secondary markets (Chart 2). Average price on the primary market has been fluctuating around PLN 4,000 per square meter, peaking in the third quarter of 2016. 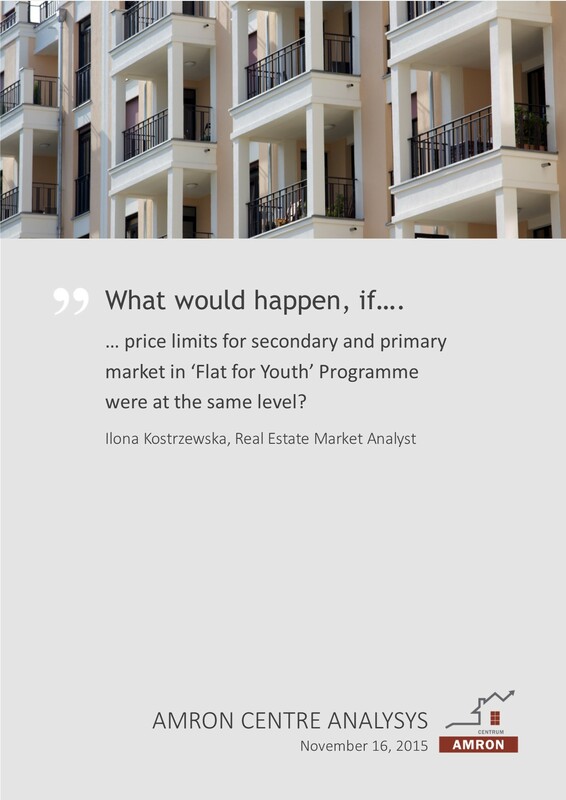 (...) Average price on the secondary market over the last few years was close to PLN 3,500 per square meter. 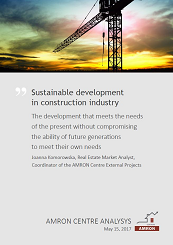 The Polish sustainable construction market thrives. Each year the number of modern certified buildings is rapidly increasing. Customers are more aware of the benefits of staying in energy-efficient, user-friendly and eco-friendly buildings, the number of professionals who are able to design and build such buildings grows as well. We witness transformation of thinking about construction industry as a consequence of global environmental changes, as well as changes in people’s lifestyles and expectations. Although building certification is still the domain of the office sector, a 25 percent increase of certified residential buildings in whole building certification market1 is optimistic and indicates the direction of future changes. 3D printing is becoming more and more popular - advertising gadgets, toys, furniture, and even dental implants that are emerging in this technology are no surprise any more. Whereas in Poland, few people have heard of houses or even entire housing estates printing. Probably, the possibility of printing objects of such dimensions is surprising. 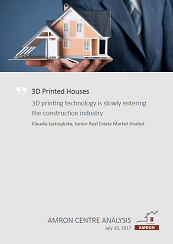 3D printing technology is slowly entering the construction industry. More and more often it is used for the production of individual structural elements, which would be difficult to manufacture in the traditional way. Since 1989, Poland has gone through a political and economic transformation, which turned out that a dwelling was beyond the reach of the average household. The situation was exacerbated by the housing deficit. 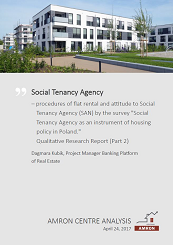 In that case, Polish government of the time decided to develop social housing and the system supporting the supply of apartments for rent with mod-erate rents was initiated as the first attempt to implement a housing policy supporting the initiative. Poznan is the fifth largest residential market in Poland. In the period from January 1, 2005 to March 31, 2017, almost 40 thousand housing units were completed in this city. More dwellings were completed only in Warsaw, Cracow, Wroclaw and Gdansk. Despite such a developed market, in terms of the availability of housing, Poznan was located on third place among the cities with the lowest purchasing power, worse situation was only in Warsaw and Cracow. Progressive economic development, increase of social needs, together with intensive environment transforma-tions generate risks, the scale and complexity of which can only be solved through integrated action of many actors. In the spirit of responsibility for the living conditions of present and future generations, the international community, represented, among others, by the United Nations, has been calling for years for involvement in sustainable development idea. This concept means development that meets the needs of the present witho-ut compromising the ability of future generations to meet their own needs. Purchase of flat or detached house is one of the most important decisions in life and that’s why it is worth ensuring that all documents concerned with the transaction are clear and understandable. 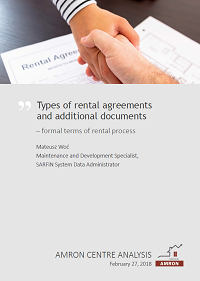 One of such a document is a developer agreement - kind of preliminary agreement concluded by developer and purchaser. Developer agreement is always concluded in form of notarial deed. Its contents and form is specified in the act of September 16, 2011 on protection of rights of purchasers of a housing unit or a single-family house. What should be included in the contract? General rules and goals of Social Tenancy Agency were presented to the survey’s participants. Their comments and previous experiences with real estate agencies’ services could be helpful to describe the most desirable scope of agency’s services, which could act as Social Tenancy Agency. In owners and tenants opinion the services of such agency should be very comprehensive and cover all kind of activities connected with the process of renting on each step of the process. Problem of rising housing prices in the world is becoming more and more serious. Effects of decreasing housing affordability are, among others, worsening standard of living (households are forced to buy smaller apartments/houses) and economic uncertainty, because spending on housing is an important part of overall household spending. In addition, smaller fraction of families can afford ownership of a housing property and houses start to be overcrowded. 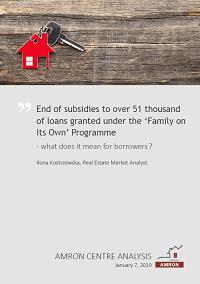 Work on new legislation, which comprehensively regulates the rules of mortgage lending in Poland, is coming to an end. On March 24, 2017, the act on mortgage loans and the supervision of mortgage brokers and agents was passed on to the President for signature. There have been no regulations dedicated to mortgage loans in Poland so far, but the provisions of the new act to greater extent sanction the rules that already exist on the Polish market of real estate financing. Now they are included in Polish Financial Supervision Authority recommendations or simply in banking practice. What are the solutions of the new act? Similarly to other major urban agglomerations, a constant increase in number of inhabitants of Wroclaw agglomeration’ counties has been observed for last several years. According to data published by Central Statistical Office, since 2005 population of the three counties bordering Wroclaw - średzki, trzebnicki and wrocławski, has increased by more than 20%. (...) Such dynamic demographic changes must have caused consequences for the real estate market, especially in the segment of building land for single family housing. Moreover, strong relation can be seen also between differences in the dynamics of population growth and the dynamics of land prices in particular counties. Social Tenancy Agency offers tenants and owners intermediation services as well as additional professional services, i.e. especially the supervision of rented dwelling, including verification of its proper usage and timely payments. This model is not focused on housing investments but on rental intermediation and related services. In January this year, two years have passed since the introduction of the BGK commercial project - Fund of Flats for Rent. 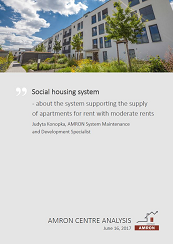 The main principle of the project was to activate the housing rent market by extended availability of dwellings for rent, popularisation of institutional rent and increasing Poles’ mobility. The project is addressed to citizens, who cannot or do not want to take out a longterm mortgage loan, as well as to those, who have experienced the housing rent on commercial terms and found it unsatisfactory, to students or to migrant workers. Warsaw is the largest residential market in Poland, very well developed both on primary and secondary market. In terms of the availability of housing, Warsaw was located on 2nd place among the cities with the lowest purchasing power, worse situation was only in Cracow. Increasing, resulting from high sales, developers’ activity in Warsaw provide adequate supply, which was flexible adjustment to market. As a result, a relative balance between the available offer and the interest of buyers was observed, which meant that average housing prices were rather stable. 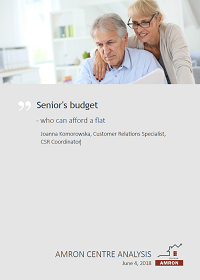 Senior citizens belong to this group of customers, whose needs have to be taken into account. Currently we can speak of separate system of so-called ‘silver economy’, which means the system of production of goods and services for the elderly. This system includes construction industry, offering housing, day-care facilities and specialized units providing care and medical services for seniors. 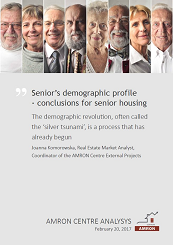 The demographic revolution, often called the ‘silver tsunami’, is a process that has already begun. 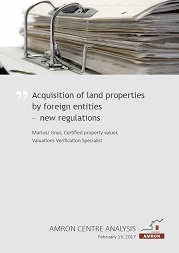 Further changes to rules of real estate acquisition by foreigners were recently implemented. Few days ago, the President of the Republic of Poland signed the amendment to the act dated March 24, 1920 on real estate acquisition by foreigners, which - together with the new act on agriculture system forming - significantly affects rules of land purchase by foreign entities. New law supplement the list of authorities obliged to provide MSWiA with the documents related to real estate purchase by foreigners and extends the list of such documents. In Poland, a shortage of housing amounts to approx. 2 million of housing units. According to data Central Statistical Office gathered during the National Population and Housing Census conducted for the reporting year 2011, the index of number of housing units per thousand citizens equals to 357, which is one of the lowest among European countries. Housing problem is one of the most serious problems of Polish society, especially acute and urgent in case of persons with low income, who are facing the threat of social exclusion or homelessness. 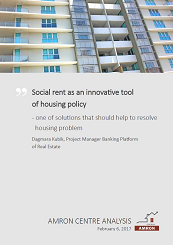 One of solutions that should help to resolve this problem in the future is social rent, implemented as the element of the state’s policy in scope of housing. A new act aiming to improve the legal environment of the entrepreneurs (Official Journal of 2016 item 2255) have been binding from January 1, 2017. The new law is the following amendment to the act of July 7, 1994 - a building code. 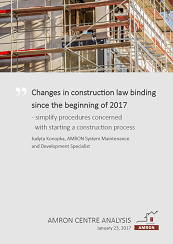 Implemented amendments have continued changes started in 2015, aiming to simplify procedures concerned with starting a construction process. New laws augment the catalogue of construction works dispensed with the procedure of the construction notification or obtaining the construction permit. 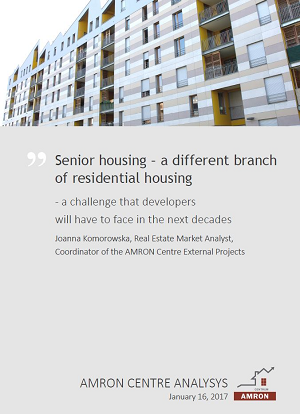 One of challenges that developers will have to face in the next decades will be providing a new standard of housing, adapted to the elderly needs . Increase in life expectancy and low level of birth rate in Poland result in increased share of older people in the population. Nowadays Polish society is the fastest ageing through all European Union countries and statistics indicate that in next 10 years there will be more pensioners than 25-year-olds, while in next 30 years people aged 65+ are to constitute 1/3 of the population of the country. The year 2016 seemingly did not bring major changes on housing market in Poland. Sale of apartments, especially on primary market, remained at high level and in most the largest Polish cities prices remained stable or showed a slight upward trend. As in previous years, low interest rates on one hand encouraged people with savings collected on bank deposits to purchase properties for rent yielding much higher return on investment, while on the other hand encouraged to borrow on favourable terms. Polish housing loans market has not begun to develop from day to day, along with the political and economic trans-formation started in 1989. High interest rates, which discouraged potential borrowers to get engaged into long-term commitments were the basic barrier for development of this market in initial, fairly long period. It took several years to appear suitable market conditions for development of banks’ lending activity. The measure of market growth is the fact that Polish banking sector granted more than 2.6 million housing loans for a total amount of approx. PLN 500 billion in the period from 2005 to 2016. Nevertheless, Polish housing loans market is still relatively young, with large disparities, comparing to other European Union countries. 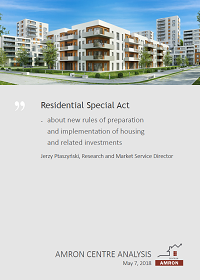 On October 10 this year, a draft amendments to Recommendation S on good practices related to mortgage-secured credit exposures was addressed to the public consultation by Polish Financial Supervision Authority. The purpose of changes is to convince banks to offer housing loans with fixed interest rate. Ministry of Finance also works on new regulations, which will persuade banks to offer such loans. The Act on mortgage loans is in the consultations and is expected to be adopted in near future, most of all due to pressure from European Commission. Meanwhile, mainly as a result of historical conditions, Polish housing loans market is dominated by loans with variable interest rates based on WIBOR 3M. Record-breaking low interest rates and the prospect of their growth make that fixed interest rate loan seems to be a very attractive solution for potential borrowers, because the initial instalment level would remain unchanged for a certain period. Ministry of Infrastructure and Construction elaborated the draft amendment to the act on protection of tenants’ rights and several other acts, including Civil code. The projected regulation is to introduce several changes concerning housing stock under the control of the municipalities, as well as - inhabitants of those dwellings. As it is stated in the justification of the new law, the main purpose of the amendment is to improve the efficiency of the social housing management, to solve the problem of social housing shortage and to assure the optimum support for the most deprived persons. The draft law is currently under public consultation, which shall last until November 22 this year. Despite the Deputy Prime Minister’s announcement stated in the Capital Building Programme that the Public Real Estate Funds (Polish REITs) would invest in residential and commercial fixed income, as well as despite provisions of the National Housing Programme, the draft law on real estate rental market companies, submitted for public consultations, excluded residential buildings and dwellings. Thus, the Polish REIT compa-nies will focus on the commercial real estate market. According On September 27, 2016 the Cabinet passed a resolution on adopting the ‘National Housing Programme’, the document specifying objectives of the housing policy until the year 2030. One of three key goals of the Programme is "Improvement of the housing availability for people, who cannot afford to buy or rent a dwelling at market prices." According to the Programme’s authors, the aforementioned effect is to be achieved by implementing the package of initiatives under the ‘Flat Plus’ Programme designed to increase number of dwellings offered for moderate prices and rents by direct investment activity of established especially for this purpose the new state entity - National Housing Operator. 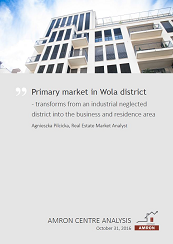 Transformation of Wola district has been observed for several years, which, thanks to the influx of new residents and companies, transforms from an industrial neglected district into the business and residence area. In the past, Wola district was dominated by huge industrial areas and post-industrial, grey housing buildings from the 50s and 60s, today it is one of the most interesting investment areas of the capital city. On sites of the old factories and warehouses, the new residential developments are built and in the area of Rondo Daszyńskiego the new Warsaw business centre has been formed with numerous modern office buildings. 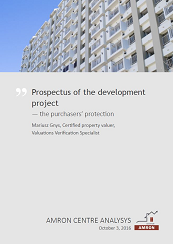 Since April 2012, developers are required to prepare a prospectus concerning every residential project. 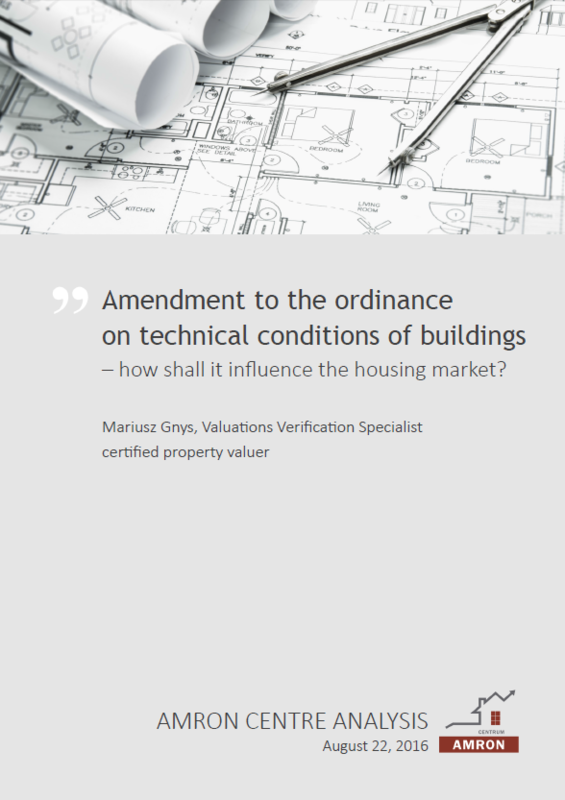 Such a document is aimed to protect purchasers of flats and detached houses constructed by developers. Careful reading of the prospectus provides comprehensive information concerning the project before signing the developer agreement (i.e. kind of preliminary agreement concluded by developer and purchaser). 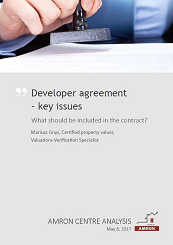 What is important, both prospectus and the developer agreement should be consistent with each other and any differences, if they arise, must be clearly described in the agreement. 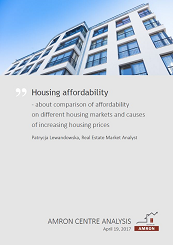 There are many reasons for the differentiation of housing prices in Poland. A number of factors affecting increase in real estate prices can be listed, it is not also difficult to find the causes of the decline trend in local real estate markets. Identification of demand and supply determinants of the housing market development allows to distinguish four main groups of factors: political, legal and organizational, social and economic. 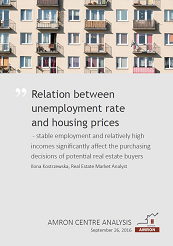 (...) The unemployment rate, which is the relation of unemployed people to the number of economically active pop-ulation, has undoubtedly a great influence on the potential housing purchasers’ behaviour and decisions. Katowice agglomeration is the largest Polish metropolitan centre. The agglomeration includes 19 neighbouring cities of the Silesian voivodship, with population of over 2 million people. The capital of the region is Katowice with more than 302 thousand inhabitants and local centres are Gliwice and Sosnowiec. The agglomeration has the highest density of railway and road network. The communication system is complemented by the Katowice Airport in Pyrzowice. POLISH BANKS ASSOCIATION STANCE ON THE PRESIDENTIAL PROPOSAL OF SO-CALLED "SPREAD BILL"
The bill on principles of reimbursement of certain receivables resulting from credit and loan agreements, commonly called the ‘spread bill’, submitted to the Parliament on August 2 this year by the President of the Republic of Poland was regarded negatively by the banking sector. In an official document, sent on September 13 this year to the Chancellery of the Sejm, the Polish Banks Association expressed the sector’s concerns about the stability of the financial sector, bank management safety and the quality of Polish law compliance. According to data published by Central Statistical Office, Poznan is a standout among the biggest Polish cities in terms of percentage of inhabitants choosing to move outside the city. CSO data show that for last 10 years almost 1% of the population has been moving out from Poznan to the city’s outskirts every year. This seems to be confirmed also by changes in number of inhabitants of city of Poznan and the Poznan county. In the analysed period, a clear, steady decline in the Poznan population size was noted and at the same time a steady, dynamic increase in number of Poznan county inhabitants was recorded. 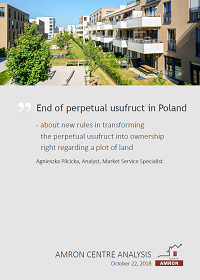 The so-called ‘small restitution act’ and officially – the amendment to the Act of 21 August 1997 on real property management, was adopted in purpose to solve the problem of Warsaw’s properties taken over by the state on the legal basis of the so-called ‘Bierut Decree’. The remaining part of the country, along with many major cities, remains in the present legal state and thus with existing problems. Find out facts after the amendment to the act on real property management. High demand on small dwellings is one of the Polish housing market specific feature – bedsit apartments are popular not only among young people, who purchase them as their first housing, but also among investors, assuch dwellings are perfect for renting. Ministry of Infrastructure and Construction has initiated changes in currently binding floor area limits regarding housing units. Such changes will allow to build higher number of flats far more tailored to the purchasers’ needs. Housing is one of the most important areas of economic and social policy of the state. Its current condition results from political changes that have occurred in the previous century, which later led to low efficiency in dealing with large population growth and internal migrations. Despite the fact that housing policy is one of the state’s obligations, reflected in Polish Constitution, there is no coherent housing policy, responding to the problem of housing availability and relation of citizens’ salaries to real estate prices. After 1989, successive governments introduced some assistance programmes. In the article you'll find the assumptions and the results of each of them. 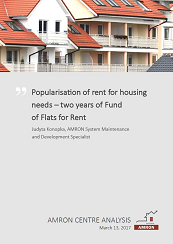 Short-term rental market of flats and apartments is now quite widespread phenomenon in Poland. There is a huge selection of locations and types of properties. Both luxury apartments in prestigious locations and ordinary flats are available for tourists in many cities. Such rental has become a way to make money for growing group of companies and individuals. Find out a story about business experiences of short-term rental pioneers in Warsaw. Demand for building land in a vicinity of the major cities is fuelled mostly by migrations, both from outside of the agglomeration as well as people intending to move out from the city and live in a detached house in a close neighborhood of it. Investment movement, manifested by considerable number of newly started constructions of detached houses may signify that the process of moving from the cities to suburban areas slowed down only for a time of economic slowdown and economic growth noted in 2015 encouraged many investors to put their earlier plans into operation again. 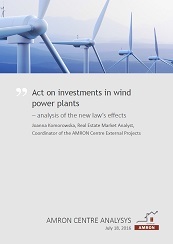 The Act of 20 May 2016 on investments in wind power plants, significant not only for the renewable energy industry, but also for housing developers, came into force in mid-July this year. The Act, widely commented in the past few months, sets out the conditions of construction and location of wind turbines in the vicinity of existing or planned resi-dential housing. Find out the analysis of the new law's effects. 62% of CHF borrowers declare their willingness to benefit from the public aid solutions, which so far are mainly different variants of currency conversion into PLN. Are the CHF borro-wers, in accordance with generally prevailing view, are actually in worse situation than those, who have taken out loans in domestic currency? As for the end of 2015, there were 1,9 billion of active mortgage loans in Polish banks’ portfolios. 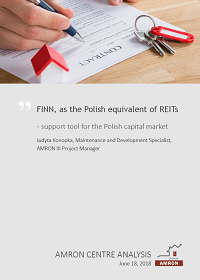 Data of Polish Banks Association published in AMRON-SARFiN Report prove that the volume of new housing loans agreements increased by 4.16% comparing to December 31, 2014 and it amounted to 181 325. 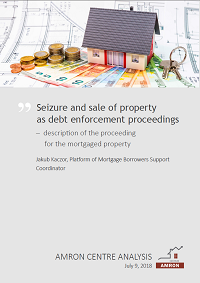 ‘Report on the condition of banks in 2015’ recently published by Polish Financial Supervision Authority presents detailed data on persons taking out mortgage loans in 2015. Who are Polish mortgage borrowers? What are their professional qualifications? How much do they earn? Are they single or married? IS THIS THE END OF THE PERPETUAL USUFRUCT OF LAND? Ministry of Infrastructure and Construction has initiated works on draft amendment to the law on land perpetual usufruct. New provisions are planned to be applicable only to plots, on which multi-family buildings are located. Starting from January 1, 2017 all shares in land perpetual usufruct will transform by law into ownership right. Proposed changes will concern only plots with multi-family buildings, excluding commercial premises. Cracow is the second in population among all Polish cities and the main urban centre of Lesser Poland region. It is also one of the top six fastest-growing housing markets and the second largest academic centre in the country. Wide housing offer tailored to the preferences of buyers, relatively stable prices and price diversity in various districts of the city reflect the maturity of the Cracow real estate market. The most popular apartments are those of two and three bedrooms with a floor area of approx. 40-80 sq.m. – in Q1 2016 they amounted to 68% of total turnover. The demand for small dwellings with a floor area of less than 40 sq.m. was also noticeable. 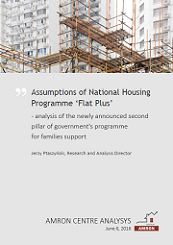 National Housing Programme ‘Flat Plus’ announced last Friday is a new government initiative planned to become one of key elements of complex programme dedicated to support Polish families. 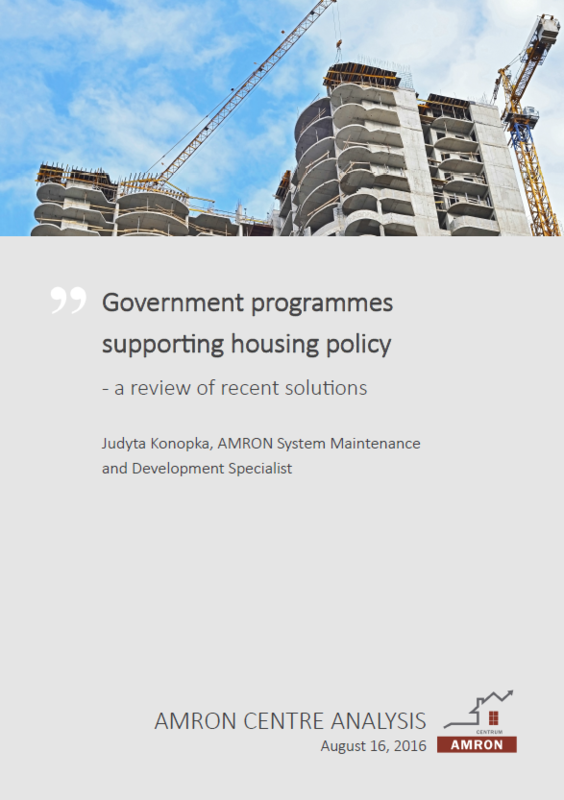 The programme’s assumptions are based on three core foundations: a National Housing Fund aimed to construct rent-regulated housing, council housing support as well as changing the principles of housing cooperatives and last but not least - encouraging individual savings for housing purposes. Execution of such a plan, besides obvious and undoubted profits for the economy or demography, involves however certain risks that should be considered from the outset. Demographic factor is one of those, which influence housing market the most, particularly in long-term perspective. Forecasted substantial structural changes in Polish population will have a profound impact, among others, on domestic housing market. Changes in age structure will be remarkable, as well as diminished number of women at reproductive age. Presently, the adult generation of secondary post-war baby-boomers is not eager to quick enlarging the family, due to changes in family model, traditions and cultural norms. How the population changes will possibly affect the housing market? After joining the EU, Poland has become a competitive market for housing investments. Over the last few months, however, investors are facing the ongoing deterioration of business conditions. Current situation has been caused by many factors, including macroeconomic, banking and legal. Polish demographic trends are also ambiguous. Although building apartments for sale is the most mature segment of Polish housing market and the last year has brought developers to record sales results, such situation will not remain unnoticed among foreign investors – both those already engaged in business activities in Poland and those, who consider such possibility. Poznan combines the function of not only the seat of local authorities, but is also a local centre of business, trade, industry and culture. It is also an innovative academic centre. 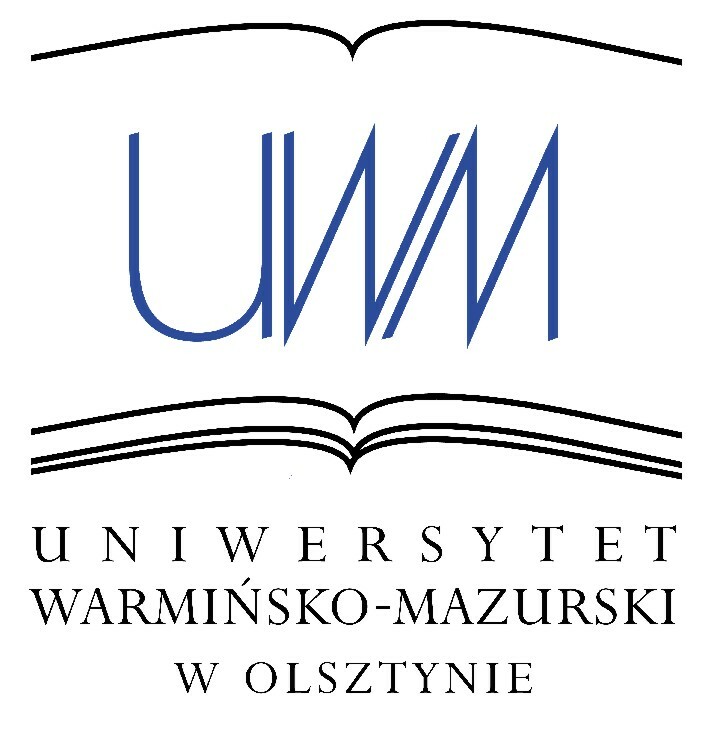 Approximately 130 thousand students are studying at universities in Poznan. That is one of reasons why small apartments are the most popular in Poznan, mostly studios and two-bedroom dwellings. 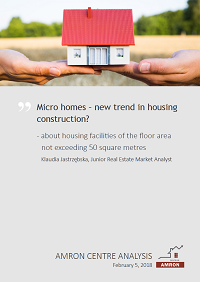 Find out the analysis of dwellings, single-family houses and building plots market in the capital of Greater Poland. 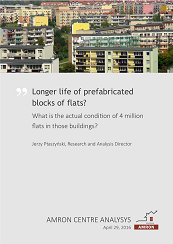 LONGER LIFE OF PREFABRICATED BLOCKS OF FLATS? 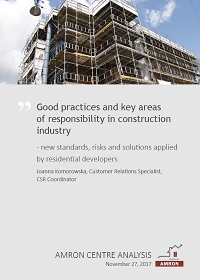 At the end of February, Polish Ministry of Infrastructure and Construction announced the audit of the current condition of prefabricated blocks of flats. It is estimated that there are nearly 4 million of flats in such buildings are occupied in Poland. Some alarmist opinions suggested that due to poor technical condition large number of those flats would have to be replaced or modernized in relatively short time. What is the actual condition of those buildings? Is it really so dramatic as it was recently claimed? On March 15, BGK suspended the acceptance process of applications for loans subsidised under the ‘Flat for Youth’ Programme. After the last year’s amendment to the act that extended the range of the Programme on secondary market and increased the subsidy amount for multi-children families, number of submitted applications grew dramatically. Already in March the sum of funds reserved for disbursements in 2016 accounted for 95% of the total sum of funds budgeted for the whole year 2016. Facing the exhausting funds, the issue of continuous publishing new ratios for calculating the maximum price binding for subsequent six months raises doubts about its soundness. Who will lose the most on this? WHO AND HOW MAY BENEFIT FROM BUILDING SOCIETIES? 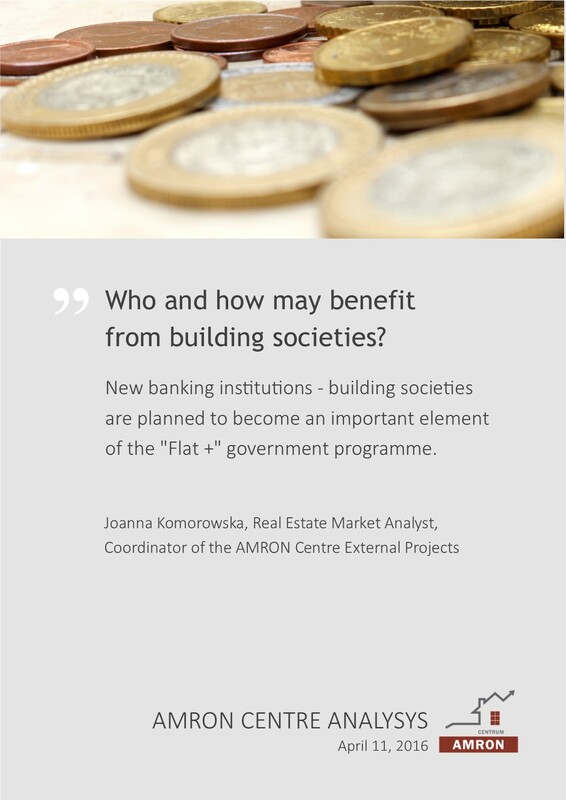 Politicians, representatives of the banking sector, developers, housing associations and representatives of organizations dealing with social issues agree that there is a need to establish a new kind of banking institution in Poland – building societies. The new programme will be dedicated primarily to families of middle and low income - the state help should enable them to meet their housing needs without risky borrowing. Wroclaw is one of the leading Polish cities in terms of developers’ offer. The fluctuations of real estate prices are only minor and the district diversity shows the maturity of the market. The preferences of buyers are quite stable and the offer on the primary market is well matched. 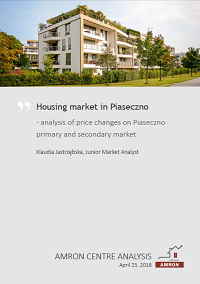 Find out the analysis of dwellings, single-family houses and building plots market in the capital of Lower Silesia. 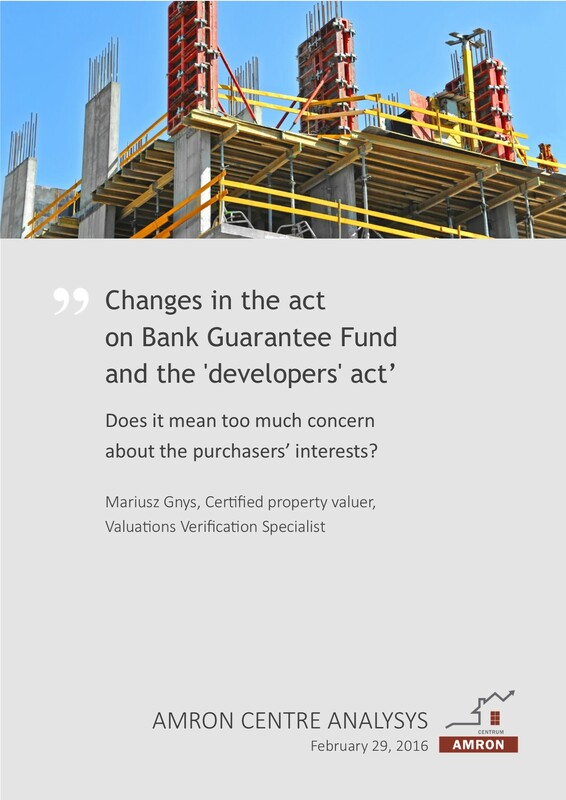 CHANGES IN THE ACT ON BANK GUARANTEE FUND AND 'DEVELOPERS' ACT' - TOO MUCH CONCERN ABOUT THE PURCHASERS' INTERESTS? The draft act on changes to the act on Bank Guarantee Fund was passed to the Parliament. The purpose of the amendment is to protect the purchasers on primary market from the bankruptcy of banks keeping the developers' escrow accounts. One of the major changes that amendment to the ‘developer’s act’ would introduce is elimination of open escrow account, unsecured by any bank or insurance guarantee. If the proposed changes come into force, who will feel the effect more: homebuyers or developers? Last year’s amendment to the act on Act on state aid in young people first housing purchase adopted in September last year enabled to subsidy the housing purchase on secondary market. Due to that change, popularity of the Programme significantly increased. Volume of applications for preferential loans hit its records month by month: in September 2015 it amounted to 3 744, which was over twice more than in last month of the Programme’ operating on the previous rules. What is the future of the Programme? 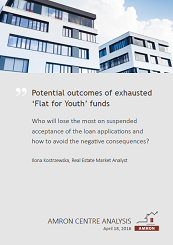 Increased level of minimal downpayment required by the Polish Financial Supervision Authority (KNF) from potential borrower will lead to saving demands. Higher initial capital means more secure loan, lower credit instalments and shorter repayment period. 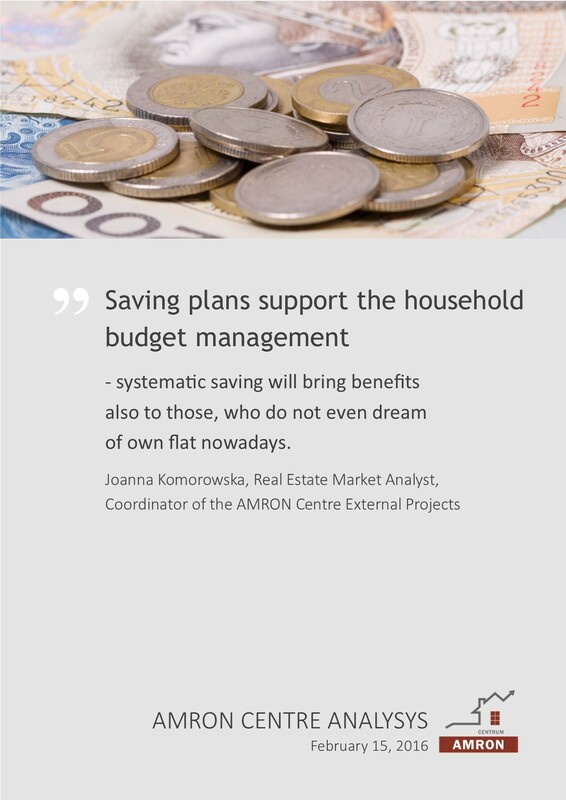 Systematic saving will bring benefits also to those, who do not even dream of own flat nowadays. According to data published by Kronenberg Foundation, 67% of Poles understand the need to save in order to secure their future, 63% of us talk about household budget, saving and investing, 60% would be able to save certain amount of money. But do Poles actually save? According to data presented by Agricultural Property Agency, land prices in Poland have been rising constantly for 10 years in a row. The prices increase was not disturbed even by the financial crisis that trembled other segments of real estate market. Expectations on continuous prices increase were cut out on August 5, 2015 by adopting the new act on agriculture system forming. However, the new government found the protection level provided by the new regulation still insufficient and therefore started to work on further limitations. 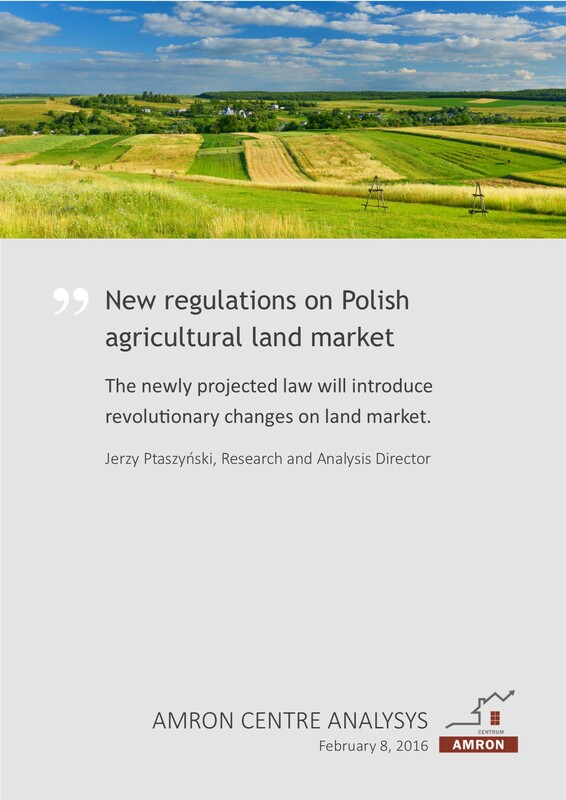 The projected law will introduce revolutionary changes on Polish agricultural land market. 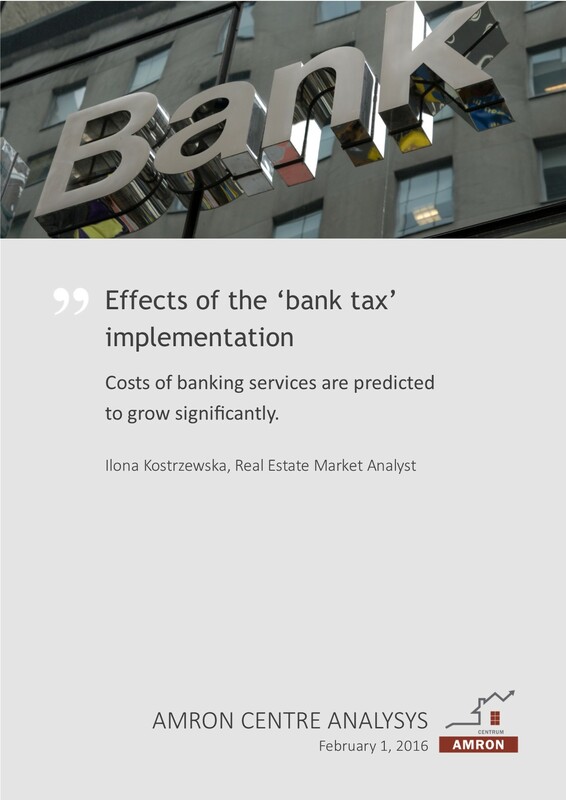 On January 15, 2016 Polish Parliament adopted the act on certain financial institutions tax. In concequence, from February 1 all domestic banks, foreign banks branches, credit unions, insurance and reinsurance undertakings and credit companies will be subject to so-called 'bank-tax' accounting for 0.44% of the assets amount. As a result, costs of banking services will significantly grow - in purpose to prevent potential losses, banks and other financial institutions have already started to increase fees and commissions. 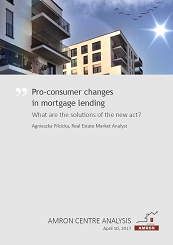 According to the researches of ‘Banking Monitor’ published in December 2015 by TNS Polska SA, the end of last year was the time of mortgage market revival. Projected margins increases, growth of the minimal downpayment, as well as a record-breaking number of applications for subsidy in ’Flat for Youth’ Programme led to increase in mortgage loans demand. Low interest rates, rise in average wages and stabilization of housing prices were also factors that supported the increased number of housing transactions, both for private and investment purposes. Meanwhile, consumer sentiment as well as banking sector forecasts are not quite optimistic. Last year we have witnessed several important changes on housing market, however prices in most of Polish cities remained stable. Despite the slight fluctuations of the average prices on the biggest markets, demand and supply were actually in balance. Series of interest rates decreases resulted in reductions in mortgage loans interest rates and therefore increased the Poles’ creditworthiness. Nevertheless, volume of newly granted loans diminished constantly until Q2 2015, when downward trend was stopped. Mortgage lending results recorded as for the end of Q3 allow to predict that the result of the whole year may be slightly better than the results of 2014. 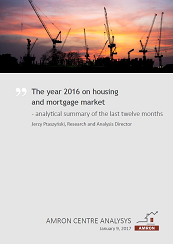 What affected the Polish housing market in 2015 the most significantly? According to the new Hypostat 2015 report published by the European Mortgage Federation, Poland is among those EU countries, in which the owner occupation rate is one of the highest. As many as 82.4% of the total housing stock are condominiums. This puts Poland at a comparable level with the Czech Republic, Latvia, Malta and Estonia. A larger share of condominiums has only Bulgaria, Croatia, Slovakia, Hungary, Lithuania and Romania. The share of condominiums in most of the “old” European Union countries looks differently - in Germany it amounts to 53.3%, in Austria 57.5%, in France 63.7%, which represents respectively less than 65%, 70% and approx. 77% of Polish indicator. The average transaction price per 1 sq.m. of floor area in Warsaw has been slightly growing for last three quarters. Price fluctuations in particular districts of Warsaw, both on primary and secondary markets, did not exceed 4% (in comparison to Q2 2015). Analysis of the structure of turnover volume in Warsaw allows to extract two groups of districts - districts located in the north and west of Warsaw with lower average size of sold dwellings and the group of districts in the south and east of Warsaw with higher average floor area of newly sold housing units. Noted differences are quite substantial and reach the level of 10-12%. Last year was very successful for developers – it resulted in very high number of investments brought into the market, as well as in spectacular sales results. The increasing developers’ activity was noticed already in 2013, when favourable market conditions started to generate demand on a stable high level. Developers achieved very good results both in terms of number of construction permits issued, constructions started and housing units completed - according to data published by Central Statistical Office, in Q3 2015 in all those categories there was approx. 20% increase compared to the same period last year. How long will that that propitious moment last and can any symptoms of changes be already seen? 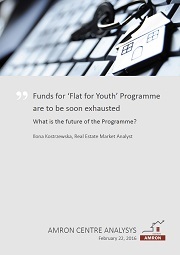 The most controversial issue related to the ‘Flat for Youth’ Programme was the fact that it excluded secondary market and therefore favoured the developers. Amendments to the Act on state aid in young people first housing purchase, which came into force on September 1, 2015, extended the possible subsidy to housing purchased also on secondary market. Main argument for that change was a need to stimulate the turnover on smaller, local markets. 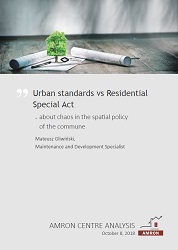 What was the influence of the latest amendments on the turnover in big cities like Warsaw? Are the binding limits adjusted to the current prices level in Capital city? 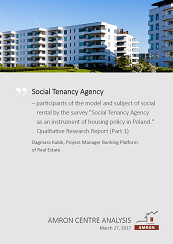 Despite the percentage of people living in leased apartments in Poland is still very low (below 10%), the sector of private residential lease grows constantly. According to Eurostat data as for 2014, 1.6 million of Poles (i.e. 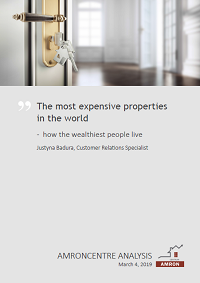 4.3% of the whole population) lease apartments on commercial basis. Comparing this data with statistics for the year 2009 (2.2% of population) proves rapid progress in that field. Solid foundations for further development of that market sector have been built and it seems that nothing should prevent from constant increase in popularity of residential lease as the alternative to housing ownership. Starting from January 2016, the new, significantly increased limit of LtV ratio comes into force. It means that banks’ clients interested in taking a mortgage loan will be obliged to contribute 15% of property value. Ultimately, from the beginning of 2017, limitation of the LtV ratio will be set on the level of 80%. 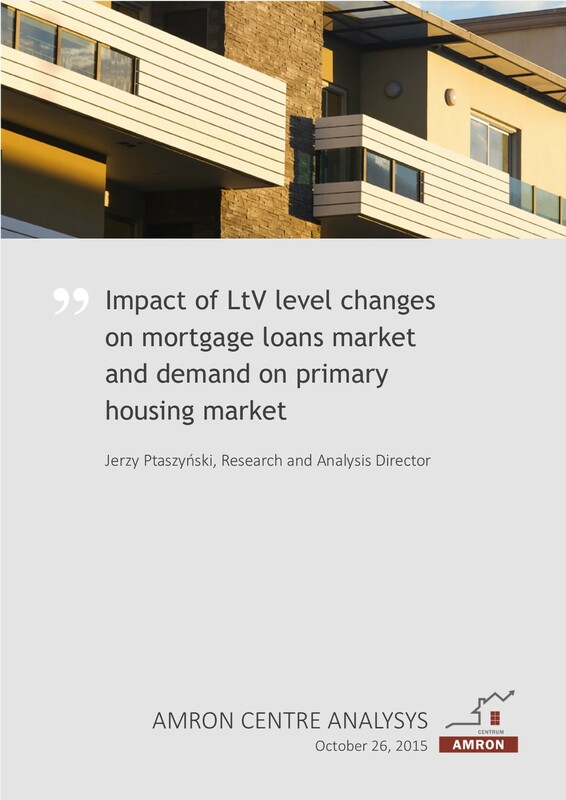 Most of market players, in particular developers, consider the downpayment’s increase as the major factor that may possibly have negative impact on demand on mortgage loans and – in consequence – on housing. Is it really something to worry about?